Whether it’s paper cutting, patchworking, or creative textiles, my courses give them a contemporary spin and makes learning a rewarding and fun experience. I offer a range of inspirational courses and workshops which can be tailored to suit you. I have also designed and produced a range of eye catching printed items based on my typographic paper cuts available in the shop. My name is Christine Green and I look forward to helping you find your creative side! If you missed seeing me and some other talented crafters on the very first episode of ‘Make!’ you can view it here! Don't miss my upcoming courses, see if there is one near you. I offer inspiring and highly creative courses at a variety of teaching centres across the UK or from my delightful thatched cottage or, alternatively I can come to you. Expert tuition with a large dollop of fun thrown in which suits both the crafting novice or more accomplished maker alike. Paper cutting is the on trend craft of the moment, but it dates back many years and is an international craft with traditions in China, Mexico and Poland. Machine stitched patchwork enables speedy production of all manner of items: designs can evolve organically resulting in unique pieces. 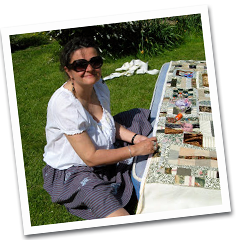 Hand stitched patchwork has a wealth of tradition and history behind it whilst being right up to date with its recycling ethos. There are two techniques you could master. Daughter of graphic designer parents, niece of a photographer, painter and printmaker, granddaughter of a wedding photographer and painter, my destiny was set very early on by the influences of my forebears; I was going to be arty; speciality unspecified and to be honest that’s how it has been throughout my life.